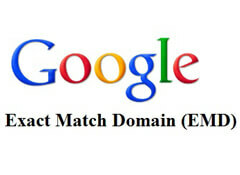 EMD stands for Exact Match Domain and it refers to a domain name that is identical to a search query. For example, keywordtool.io is an exact match for the search query “keyword tool”. If you do a google search for "keyword tool", this site comes up right at #1. This keyword is extremely competitive and drives a lot of traffic to the site. A few years back, this tactic was widely used by online marketers to drive traffic to their websites. Its popularity largely stemmed from how easy this trick was compared to other SEO tactics like link-building, creating quality content, competitor outreach, keyword research, and user experience optimization. All you had to do was create was a website who domain name exactly matched a popular search query. Consequently, ‘good keyword’ domains were sold for a massive premium since EMDs were directly proportional to traffic. Google was quick to catch on to this trend an introduced the EMD update in September 2012. This effectively reduced the likelihood of low quality sites ranking well because of exactly matching domain names. This has had a major impact on the ranking of EMD spam websites many of whom stopped listing even in the first hundred search results. Indeed, it is very difficult to recover from such penalties. Initially, only a small portion of websites were affected. Matt Cutts from Google claimed that it merely affected “0.6% of English-US queries to a noticeable degree”. However, with Google’s increasing dependence on AI (RankBrain), most experts anticipate that many more spam sites with EMDs will soon have to pay the price for their dubious practices. Does EMD truly impact ranking? This brings us to the question of legitimate websites using EMDs. How do they perform compared to other websites in their niche? According to a study conducted at the end of 2014 by CanIRank, keyword domains ranked about 11% higher than brand-able domains. Further, brand-able domains required a 22% higher Page Authority score to rank in the top ten search results. Even more surprisingly, keyword domains were capable of achieving the No. 1 position with about half as much content even with a much lower keyword density. Even though things might have changed a little bit in the last two years or so, it is evident that EMDs are still very valuable from a SEO perspective despite Google’s 2012 EMD algorithm update. In fact, there are some couple of high-profile EMD sites that rank extremely well on the search engine results page and are considered by Google to be very trustworthy. Bookings.com and cheapflights.com are two widely known examples of the same. Basically, legitimate businesses with exact matching domain names do not have much to worry about as long as they implement white hat internet practices. However, for spam websites on the other end of the spectrum, there is definite cause for concern. If you are operating a poor quality spam site that is using a keyword domain to drive traffic to your website, then it is rather likely and perhaps even inevitable that Google will find you and penalize you for your unethical practices. This view is substantiated by Gary Illyes’s - Webmaster Trends Analyst at Google - recent tweets on websites with keyword domains. He tweeted “there is no inherent problem with EMDs. The problem is when it's combined with other spam tactics.” Hence, if you are thinking of selecting a domain name based on a seemingly valuable keyword combination, you can sleep well as long as your web content is otherwise trustworthy. However, most SEO experts recommend that you incorporate your brand-name into your domain instead of stuffing it with keywords. Although your search rankings might be a little worse as opposed to EMD, this can be easily remedied with a bit of time and effort. To summarise, there is no straightforward answer to question “Do EMDs Work in 2017?” The short answer is that they do. There is simply no doubt about that. The caveat is that this alone is not enough to rank well unless you signal to Google that your site is trustworthy and legitimate. This is only possible through white hat best practices that include link-building, user engagement, trustworthy domain information, building brand signals and so on. KeywordTool.io has done all of these quite well. Nonetheless, there are much better SEO strategies and tactics that you can adopt to improve your search rankings. Using exact matching domains might help you rank better in the short term but this is a very myopic approach. There is a very high chance that Google might penalize your site for this in the not-so-distant future if it does not consider it to be trustworthy. It is almost always a better idea to use a branded domain to signal to Google that you are a unique brand. Along with this, create a detailed ‘About Us’ page where you talk about your brand, its history and motto. Set up social media accounts, a YouTube channel and reach out to big names in your industry to get solid back-links. This is a long-term approach that will ensure that your site ranks consistently well in-spite of Google’s periodic algorithmic changes.